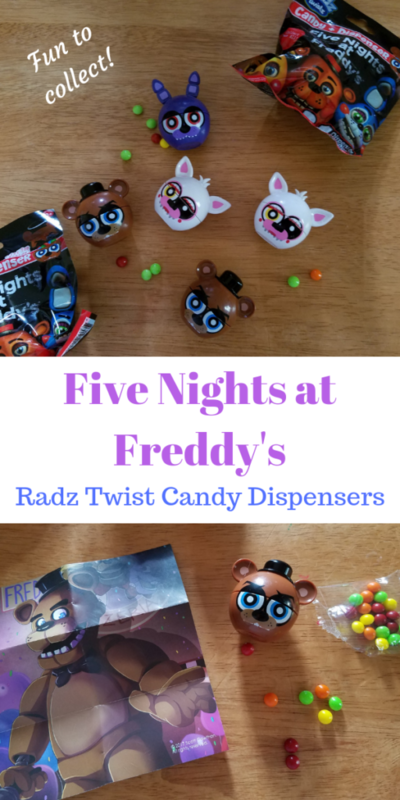 Have you seen these Five Nights at Freddy’s Radz Twist Candy Dispensers? My boys love Five Nights at Freddy’s. Especially my older son. He has a collection of all kinds of stuff like figurines, posters, and plushies among other things. I personally think of them like zombified stuffed animals or something of the sort. Anyway, I was recently contacted and asked if I would like to collaborate on a review and we were sent some of these candy dispensers in exchange for my honest review. My son was pretty ecstatic. 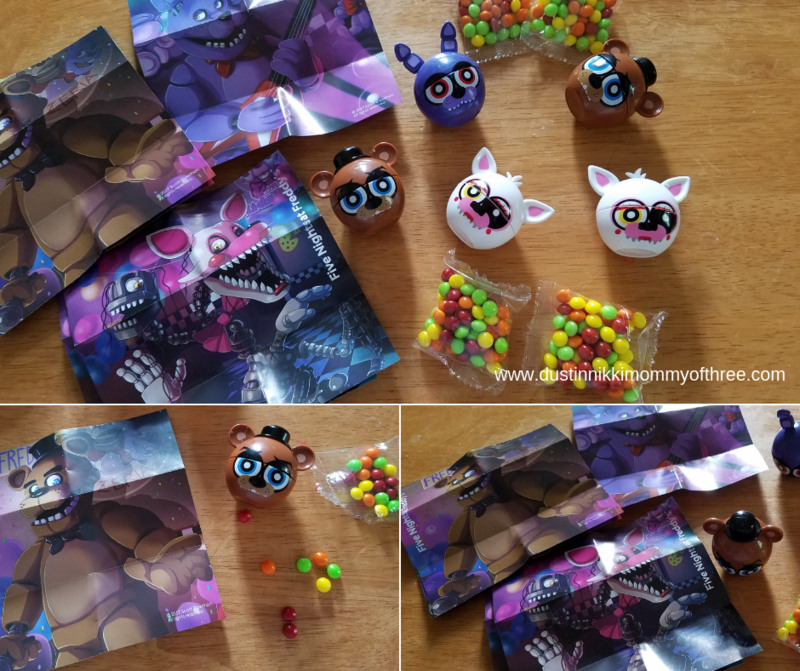 Inside each package you get a Five Nights at Freddy’s character candy dispenser, a mini poster featuring the character you got and a little pouch of candy. There are 8 different characters you can collect. You can collect Freddy, Foxy, Chica, Puppet, Bonnie, Toy Chica, Mangle and Toy Bonnie. Radz also has other kind of candy dispensers as well. 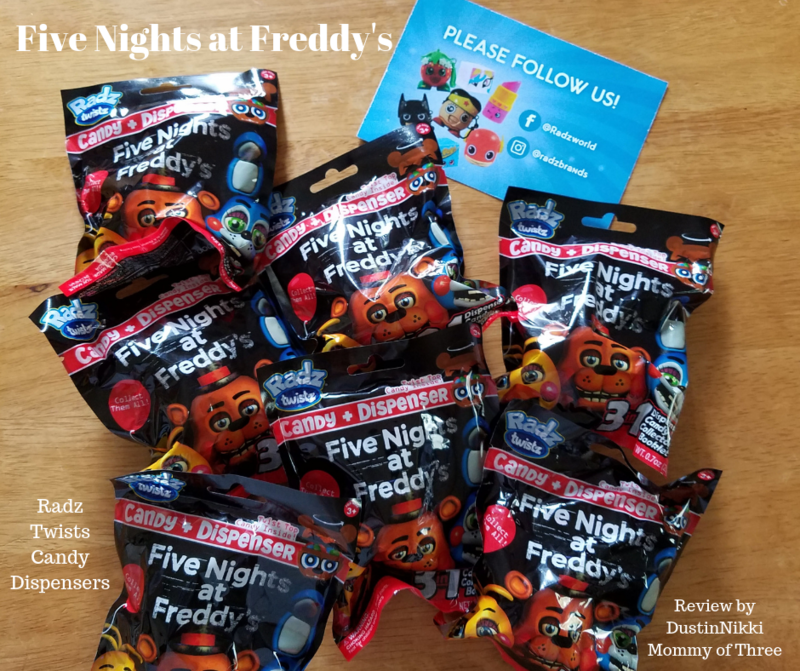 They also have come cubed Five Nights at Freddy’s dispensers too. There are 9 of those ones. I do want to note that these are not blind bags. On the back of the packaging, there is a little window so you can see which character is inside. 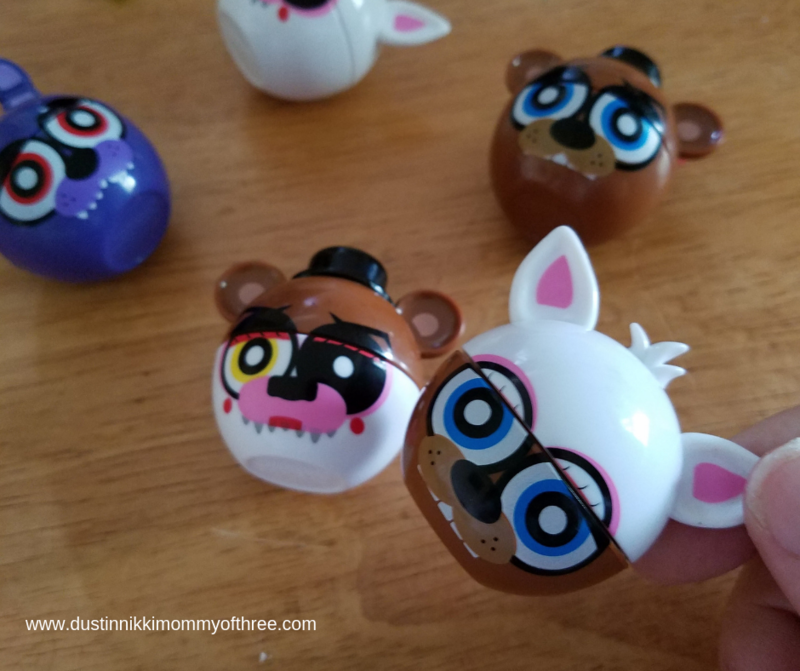 Blind bags are fun and my kids love them but since I have a kid that likes to collect certain things, I think this is pretty cool. That way we know which character we are getting. The Radz candy that comes with these dispensers comes in 4 EXCLUSIVE shocking flavors – Eerie Orange, Spooky Citrus, Shock Berry Blast, and Chilling Cherry. Radz candy is also gluten-free, peanut-free, and kosher certified. It’s a hard candy. At first I thought the were gummy because they look like little jelly beans. They have a candy covering and they are kind of sweet but tangy. Not completely sour though. The candy and the flavors are actually pretty good. 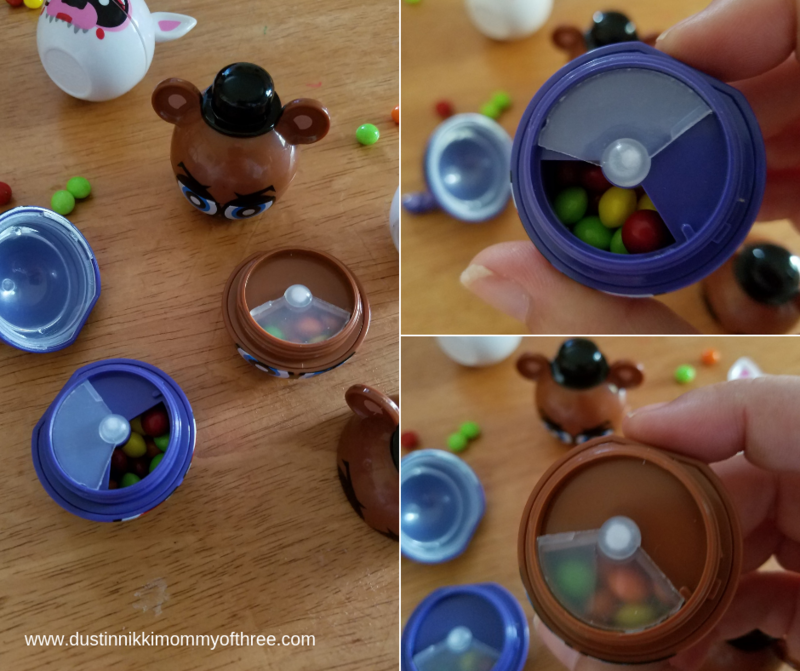 Filling the dispensers with candy is pretty straight forward. 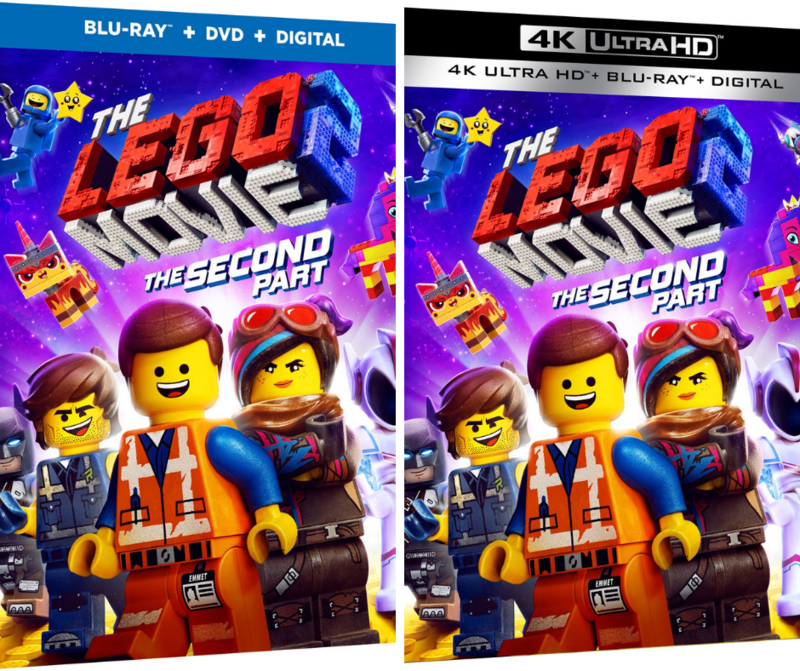 You twist off the top half of the character. The bottom half holds the candy. There’s a somewhat clear plastic cover that slides open. Slide it open and put the candy inside. We could only fill the dispenser with about half of the candy that came with it so it can be filled at least twice. This is another fun way to play with the dispensers. All the parts fit with others so you can twist them apart and mix and match the characters. What I love about them is that the character faces always line up. It doesn’t even matter if you are mixing and matching them. They always seem to line up the way they should. When twisting them closed, you can also hear something like a click when you can turn them anymore. The sliding part on the inside housing the candy also clicks in place so it doesn’t just randomly slide open. As weird and creepy as these Five Nights at Freddy’s characters usually look, these are really cute. My boys love them. My older son has a small collection of them now. He’s on the hunt for a few of the characters he’s missing. I personally thought the candy was pretty good too. I think they are fun to play with too since you can mix and match them. There are other candy dispensers out there (generally speaking) that you really can’t so anything with after the candy is gone. 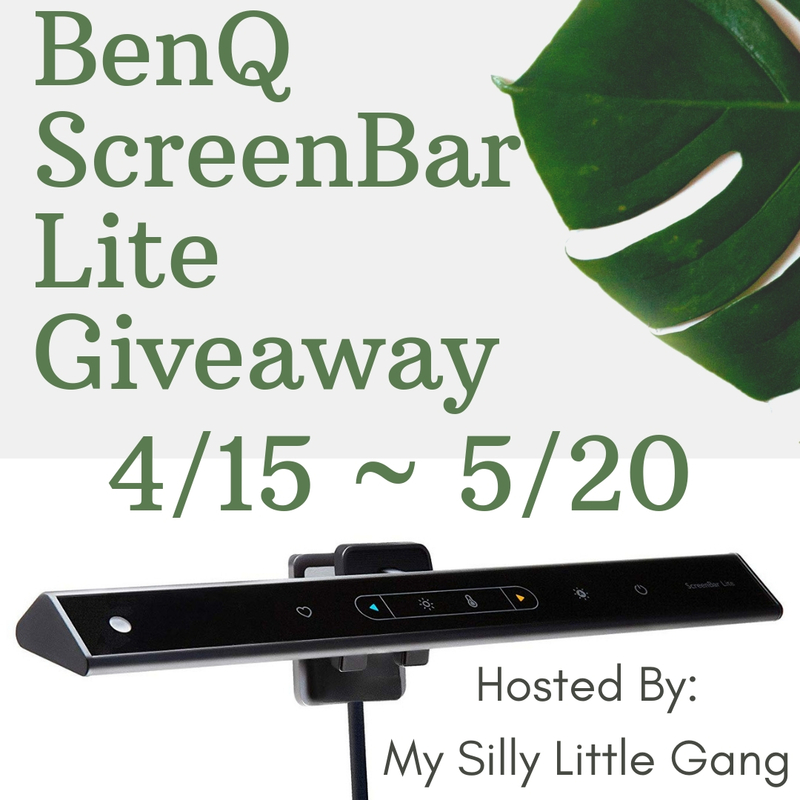 Fun to play with, fun to collect, and the candy is also pretty good! 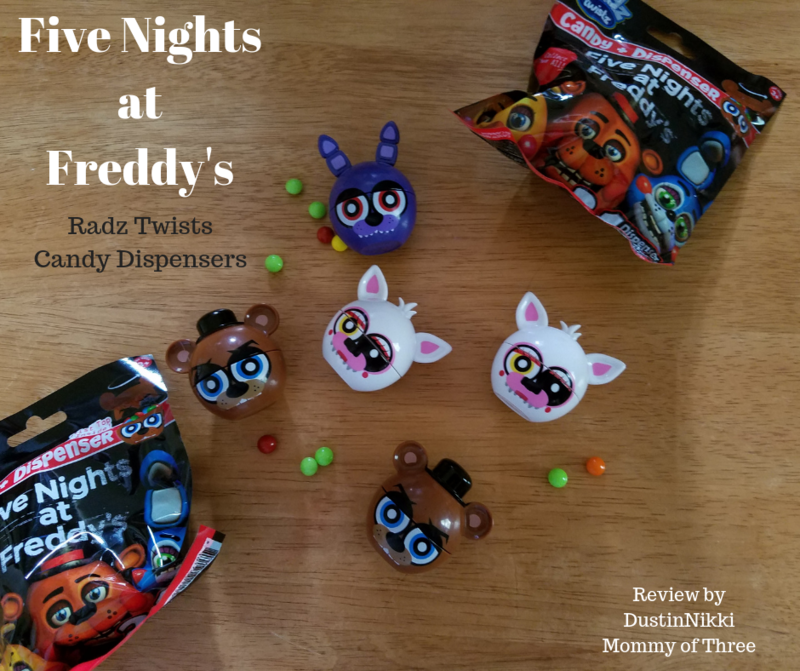 Buy It: Five Nights at Freddy’s Radz Twist Candy Dispensers are available at stores like Walmart and Target. Suggested retail price is $3.99 each.